Abdul-Rahman Hamad - Who is Abdul-Rahman Hamad? Born in Beit Hanoun, Gaza, in 1944; received a BA in Electrical Engineering from Alexandria University, Egypt, in 1967, and an MSc. and PhD in Electrical Engineering from Wisconsin University in 1972 and 1975, respectively; worked as engineer and reconstruction specialist in Tripoli, Libya , from 1968-71; then Assistant Professor in Control and System Engineering at the Technology University in Baghdad from 1976-80, and Dean Assistant for Academic Affairs in Control and System from 1979-80; joined the Electrical Engineering Dept. at Birzeit University as Assistant Professor in 1980 (until 1984) and head of Dept. from 1982-84 and again from 1989-91; then Dean of the Engineering Faculty at Birzeit from 1991-94; was a Palestinian delegate to the negotiations in Washington in the early 1990s; worked with PECDAR as Dir.-Gen. for Projects during 1994-96; served as Vice-Chairman of the Palestinian Housing Council and as Vice-Chairman of the Board of Arab Corporation for Technical Development; Chair of the Palestinian Energy Authority from Feb. 1995; was elected to the PLC (Fateh) for the Jabalia district in the Jan. 1996 elections; was appointed Minister of Housing in 1996-2002; appointed PA Minister of Natural Resources and Energy on 9 June 2002 (until April 2003); Chairman of the Board of Directors in the Gaza Electricity Distribution Corporation; Vice-Chairman of the Board of Trustees of Al-Azhar University, Gaza; member (without portfolio) in the PA’s Oct. 2003 Emergency Govt. 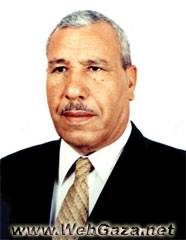 ; was appointed Minister of Housing & Public Works in the cabinet of PM Ahmed Qrei’a of Nov. 2003 (until cabinet reshuffle in Feb. 2005).